City hall officials say the three-storey building in which David Brian Campbell died contained an illegal number of apartments. A fire early Wednesday in a south London house killed one man and sent tenants from the six other apartments in the house scrambling to safety. 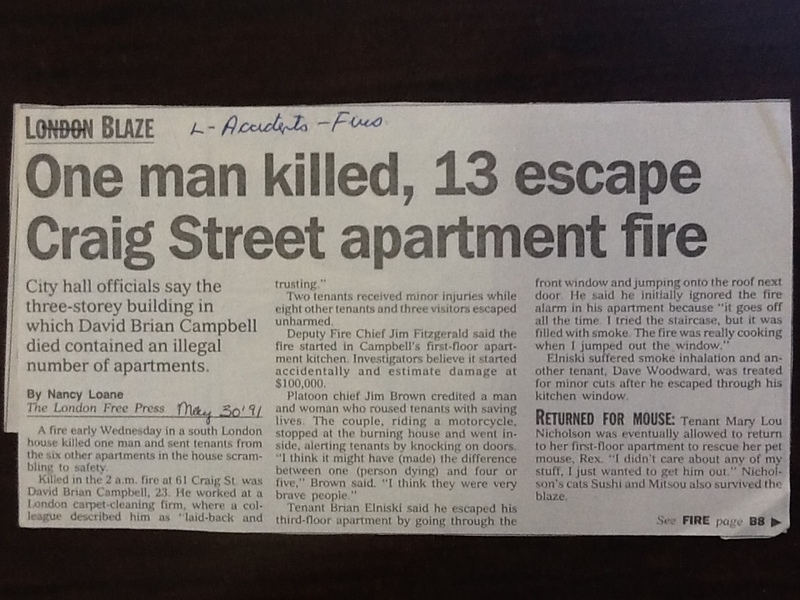 Two tenants received minor injuries while eight other tenants and three visitors escaped unharmed. Deputy Fire Chief Jim Fitzgerald said the fire started in Campbell’s first-floor apartment kitchen. Investigators believe it started accidentally and estimate damage at $1000,000. Returned for Mouse: Tenant Mary Lou Nicholson was eventually allowed to return to her first-floor apartment to rescue her pet mouse, Rex. “I didn’t care about any of my stuff, I just wanted to get him out.” Nicholson’s cats Sushi and Mitsou also survived the blaze. Fire inspector Steve Guay said the investigation had narrowed the cause to an electrical problem with an air-conditioner or a deep fryer. The tenants will have to find other accommodation while building owner Alex Faltynek decides whether to rebuild. City hall officials say the three-storey building contained an illegal number of apartments. The building has seven apartment units, but according to city records, it has been zoned for four apartments since 1970. Street rezoned: London director of building controls Rocky Cerminara said “the house had four apartments in 1970, when the street was rezoned from multiple-family units to two-family dwellings. The four apartments were allowed to remain. But building permits were never issued for the three apartments built since, he said. Faltynek refused to say when he bough the building. 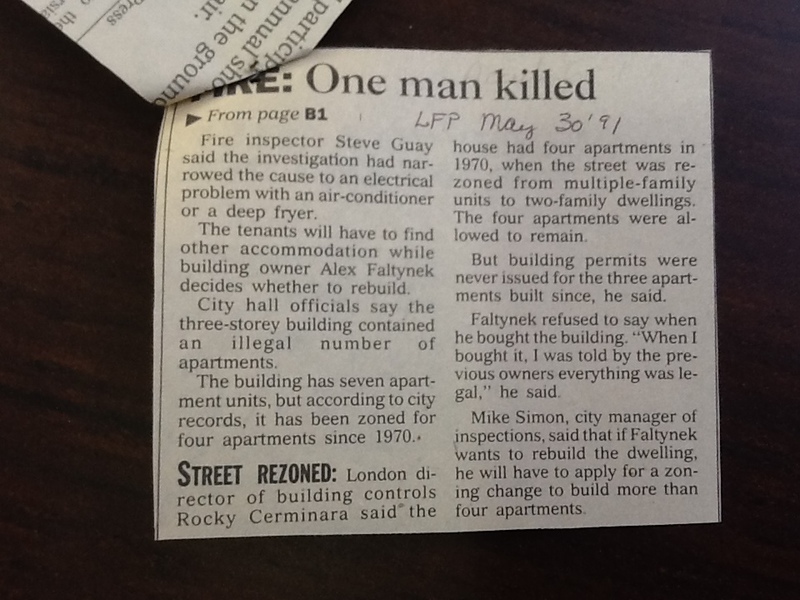 “when I bought it, I was told by the previous owners everything was legal,” he said.\Mike Simon, city manager of inspections, said that if Faltynek wants to rebuild the dwelling, he will have to apply for a zoning change to build more than four apartments.